I was needing a thank you card for a lady at work and thought this was perfect. If you know me or anything about me, this totally screams BECKY out loud! 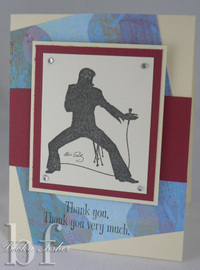 I used another one of my Elvis stamps from CHF. The paper is from the Pocket full of Posies Stack from DCWV. I also added a little bling in the corners. I hope my friend likes it.